Consider giving these coloring books to a group or organization you care about. "Face of Love is Universal: 64 Faces in 64 Days!" ​Changing the world one Wisdom Keeper at a time! ​Also available NOW on Amazon The Wisdom Keepers Oracle Deck and ​The Wisdom Keepers Inner Guidebook--the 300-page, updated, easy-to-read version of the mini-Wisdom Keepers Inner Guidebook that comes with The Wisdom Keepers Oracle Deck. The 64 Faces of Awakening Coloring Book welcomes you into the gaze of the Wisdom Keepers. This is not your ordinary coloring book. Page by page, you have the unique opportunity to welcome a beautiful, healing and transformative relationship into your life. The Wisdom Keepers are here to capture your imagination, awaken your Gifts and leave you feeling seen, cherished and supported. Relax into their restorative, loving and compassionate presence. The 64 Faces of Awakening are like soul windows, encompassing hidden worlds. Each face is filled with evocative shapes, animal totems and universal symbols. Whether you choose to use a colored pencil, an artists' marker, a watercolor pencil or a crayon, infuse these faces with colors that inspire you. Look into their eyes, and feel your heart open. 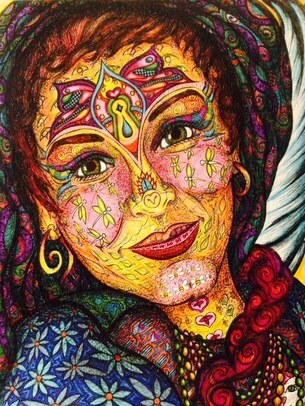 Would you like to send pictures of your own colored-in Wisdom Keepers to Rosy? She'd love to share some of these creative, playful expressions as an inspiration to others via the 64faces.com FB page and Instagram. An astounding number of overwhelmed and overworked adults are now turning to coloring books to soothe the stressed out soul, reclaim the creative spirit, and have some (much needed) fun. I experienced these very same longings during a particularly stressful time in my life—to drop in, fret less and play more. I yearned for simplicity, and a way to deal with the despair I felt in relation to the seemingly endless stream of suffering that pervades our planet. Little did I know that my decision to spend a little time doodling, as a simple act of self-care, would lead to the birth of the 64 Faces of Awakening, and eventually The 64 Faces of Awakening Coloring Book. As I began to share the Wisdom Keepers with others, I noticed that they too would gaze into the eyes of these wise beings, and feel seen, cherished and supported. ​It was as if the Wisdom Keepers invited people to relax, to be themselves and to trust that everything was going to be okay, even during challenging times. ​The 64 Faces of Awakening were no longer just drawings for people. They were friends, guides and mentors, transmitters of presence and compassion, with their own stories to tell and wisdom to impart. And so I embarked on the next phase of the journey, allowing the Wisdom Keepers to speak to and through me as archetypal messengers of compassion and presence. This process resulted in the birth of The Wisdom Keepers Oracle Deck and The Wisdom Keepers Inner Guidebook. After the Oracle Deck and Inner Guidebook came out, I had the wonderful opportunity to watch more and more people read the Wisdom Keepers’ stories, receive their gifts of wisdom and contemplate their evocative questions. I witnessed their comforting, empowering and healing impact. I also began to feel a strong and natural pull to infuse the faces with color. As I allowed myself to play with the rainbow and follow my self-expressive instincts, a warmth and vitality permeated my meditative process. The relationships I experienced with each of the Wisdom Keepers became increasingly alive and personal. Eventually other people began feeling the same creative impulse. My daughter and her friends were the first to insist on coloring in the faces. But then clients, friends and customers who had purchased Wisdom Keeper art prints spontaneously began their own experiments. I watched how the coloring process made room for their emotions, relaxed their bodies, and transported them into deeply restorative states of being. For thousands of years, color has been used as a healing modality and language of the soul. Carl Jung encouraged his patients to color mandalas as a means of self-exploration and meditation. Now I could see the Wisdom Keepers' potential to act as human mandalas, offering people a uniquely intimate opportunity to explore their feelings, relieve their stress, discover their Gifts and express their authentic selves. ​Creating The 64 Faces of Awakening Coloring Book was the natural next step in my ever-evolving journey. ​I certainly have experienced great pleasure coloring in these faces. ​It is my deepest hope that you do too.